We manufacture Merrill-Crowe Plants for the recovery of gold and silver from cyanide solutions. 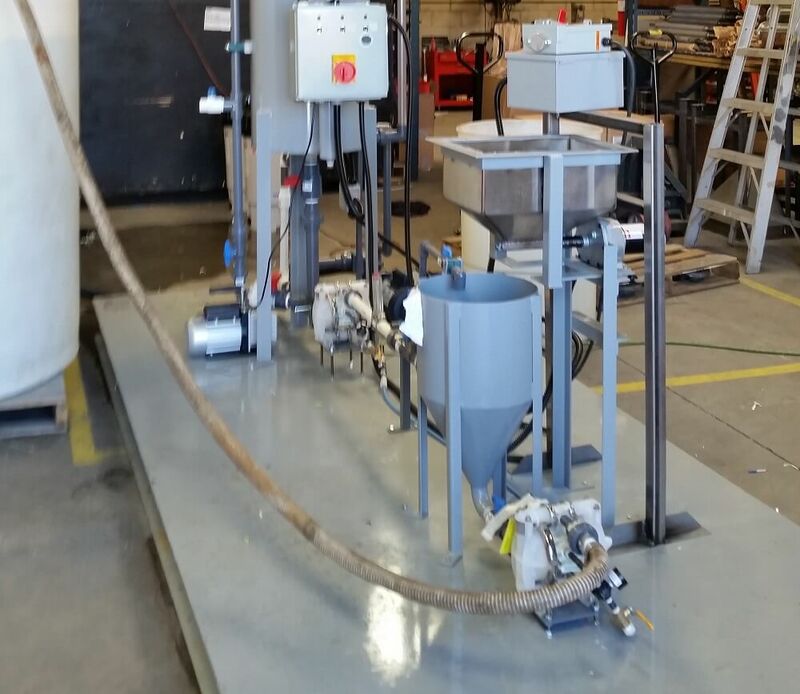 A Merrill Crowe process lets you easily precipitate gold & silver previously dissolved by cyanide using zinc dust. 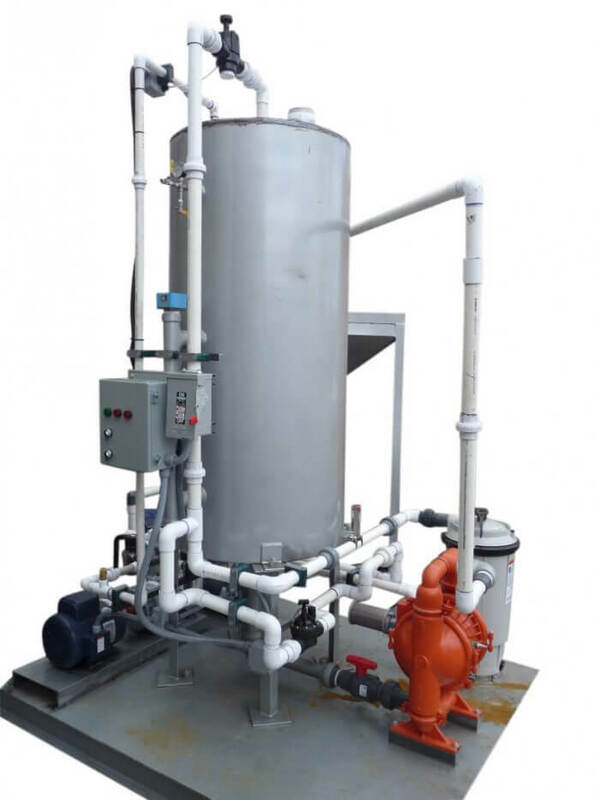 Two primary Merrill-Crowe Plant sizes are manufactured, a 10 gallon per minute plant (65 tons of solution per day), and a 50 gallon per minute plant (300 tons of solution per day). 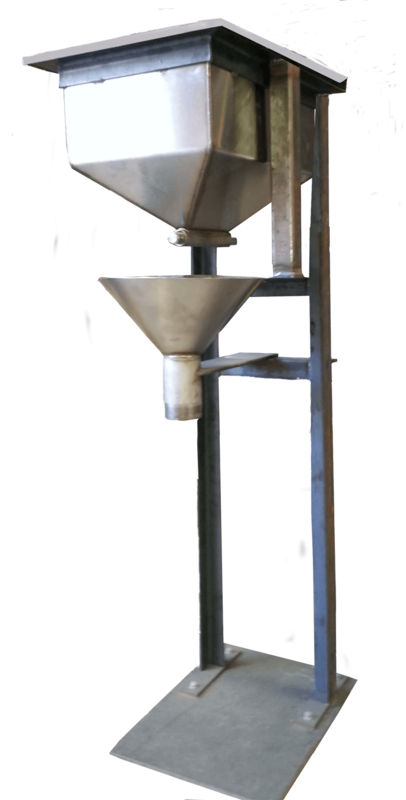 The plants are complete and include solution circulation pumps, flow meter for plant feed, de-aeration system with vacuum pump, de-aeration tower level control with recirculation system, precipitation pre-coat filter, clarifying pre-coat filter, zinc dust hopper, zinc dust feeder, instrumentation, internal piping, steel mounted frame. All plants are for continuous operation. All that is necessary for the user to supply is piping to and from the unit, external wiring to the unit and site installation. We often refer to this series of Merrill Crowe Plants as “Economy” Merrill-Crowe Plants. 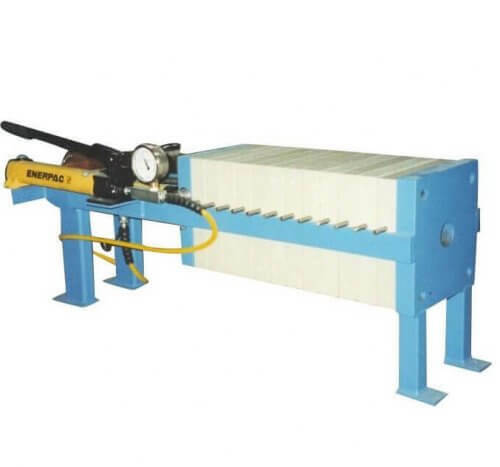 while adequate equipment is used to build the plant, it is not PREMIUM QUALITY, and therefore costs significantly less. It is a GOOD MERRILL CROWE PLANT & THAT WORKS! 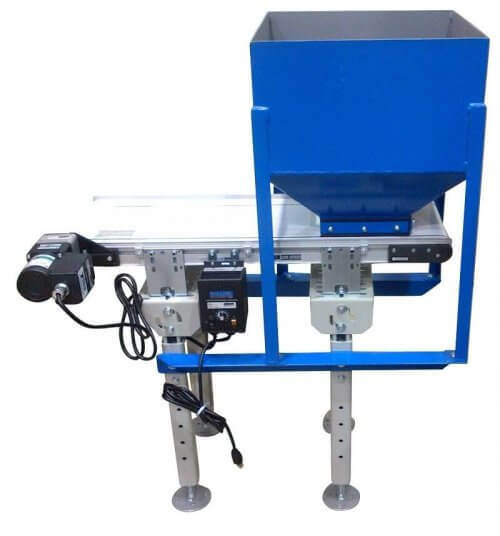 Hundreds sold have functioned in pilot testing or small volume production of gold and silver, from both heap leaching and tank leaching, all over the world. 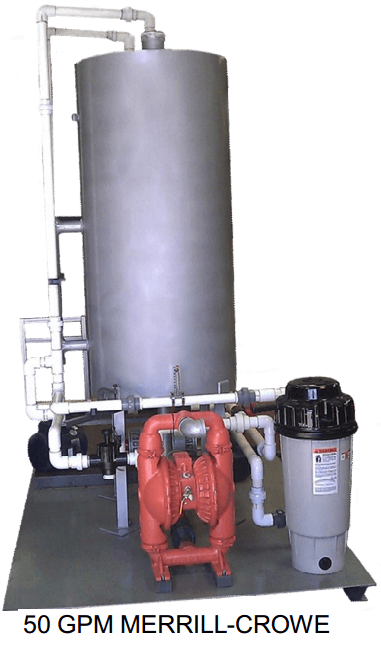 The standard configuration of the Portable Merrill-Crowe Plant uses canister pre-coat type filters for clarifying and precipitation filters. Plate and frame filters are available for precipitation filter, as an option. The dimensional size of the plant is increased when adding the plate and frame filter by approximately 3′ x 6′. We do made custom plants; contact us for details. 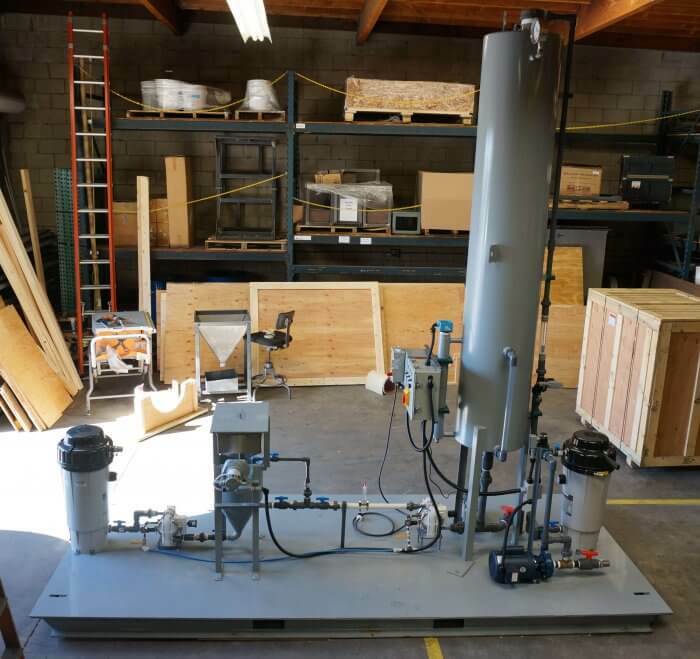 Our Merrill-Crowe Pilot plants are skid mounted, and complete with all equipment required to operate. There are several versions, starting with the basic economy plant, which is the least expensive, then upgrading equipment, which increases the costs or the plant. Currently we manufacture a 10 GPM (60 TPD) Merrill-Crowe Plant and a 50 GPM (300 TPD) Merrill-Crowe Plant. Above is a graph of plant volume processed versus the solution content of precious metals for cyanide leach of gold and silver. Generally, when the data are to the right of the curve, it might tend to favour a Merrill Crowe Plant, while to the left of the curve, it might tend to favour a carbon adsorption system for recovering the precious metals from the solution. Obviously, there is more to consider in such a decision, but this will generally hold true, and at least indicate one or the other should be considered. 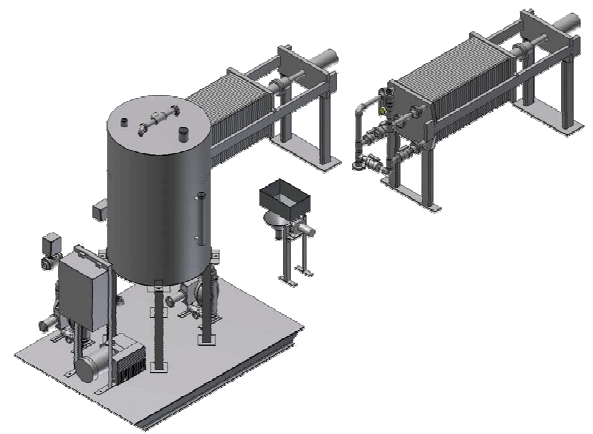 At schematic of the Merrill-Crowe Plant showing the control panel, de-aeration tower, pumps, zinc feeder and clarifying and precipitation plate and frame filters. Piping is not added for clarity. 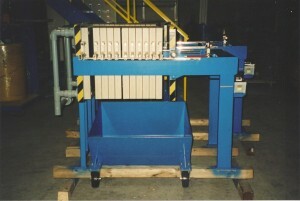 The optional filter for the Merrill-Crowe Plant, a plate and frame filter. 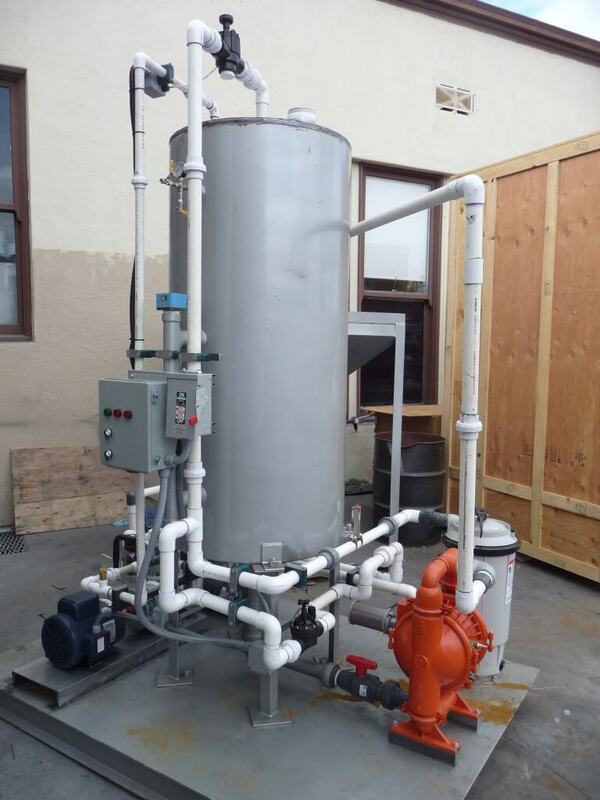 It can be used to filter the precipitates (precious metals), or as the clarifying filter, or both, if two are purchased. They can add significant cost to the plant, though, 50% or more. They are less labor intensive and give less downtime, since they hold a lot more solids, and are much easier to clean. One 65 Ton Per Day Economy Merrill-Crowe Zinc Precipitation Plant, with capacity of 10 GPM cyanide solution (pregnant liquor), complete with pregnant solution feed pump, Hayward Perflex Precoat pregnant solution clarifying filter, Perflex Precoat precipitation filter, vacuum pump, vacuum de-aeration chamber with packed tower, uniform distribution nozzle, zinc dust hopper with capacity for 4 pounds of zinc, 1/5 HP zinc dust mechanical screw feeder with variable speed, precipitation pump, instrumentation (vacuum gauges, electrode level sensor, flow meter, flow sensors, etc. ), Electrical Control Panel with all motor starters in NEMA 3 enclosure, internal piping is schedule 80 PVC, valves, pipe fittings, couplings, reducers, adapters are schedule 80 PVC (threaded unions at strategic locations are provided for easy replacement of parts), electrical requirements are 120/240 V/1 Ph/60 Hz, power requirement is 4.5 KVA, all equipment is mounted on structural steel skid, all mild steel components are primed and painted with enamel, plant is tested prior to shipment. Shipping Weight: 2,000 lbs. Ships in 2 crates: (1) 32” x 120” x 36”(H), (2) 60” x 96” x 40”(H) 213 Ft3 Total Volume Plant dimensions are 7’-6” (L)x 4′-6″(W) x 7′-11″(H). (134 CuFt) Catalog Number 050M-002. One 300 Ton Per Day Economy Merrill-Crowe Zinc Precipitation Plant, with capacity of 50 GPM cyanide solution (pregnant liquor), complete with Pregnant solution feed pump, Hayward Perflex Precoat pregnant solution clarifying filters, Hayward Perflex Precoat precipitation filters, oil lubricated rotary vane vacuum pump, vacuum de-aeration chamber, zinc dust hopper with capacity for 10 pounds of zinc, 1/5 HP zinc dust mechanical screw feeder with variable speed, Precipitation pump, instrumentation (vacuum gauges, electrode level sensor, flow meters, flow sensors, etc. ), Electrical Control Panel with all motor starters in NEMA 3 enclosure, internal piping is schedule 40 PVC, valves, pipe fittings, couplings, reducers, adapters are schedule 80 PVC (threaded unions at strategic locations are provided for easy replacement of parts), electrical requirements are 240 V/1 Ph/60 Hz, power requirement is 9 KVA, all equipment is mounted on structural steel skid, all mild steel components are primed and painted with enamel, plant is tested prior to shipment. Total Weight: 2,200 lbs. 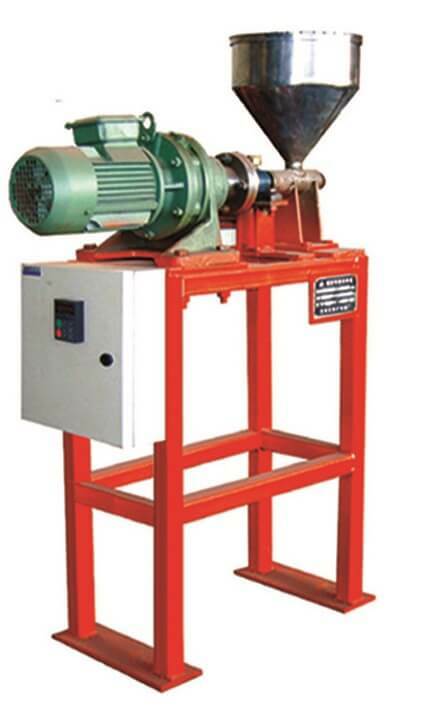 Total Shipping Volume: 400 CF Plant overall dimensions are 8′-0″ (W)x 5′-0″(L) x 7′-11″(H). Optional Clarification Filter and/or Precipitation Filter. 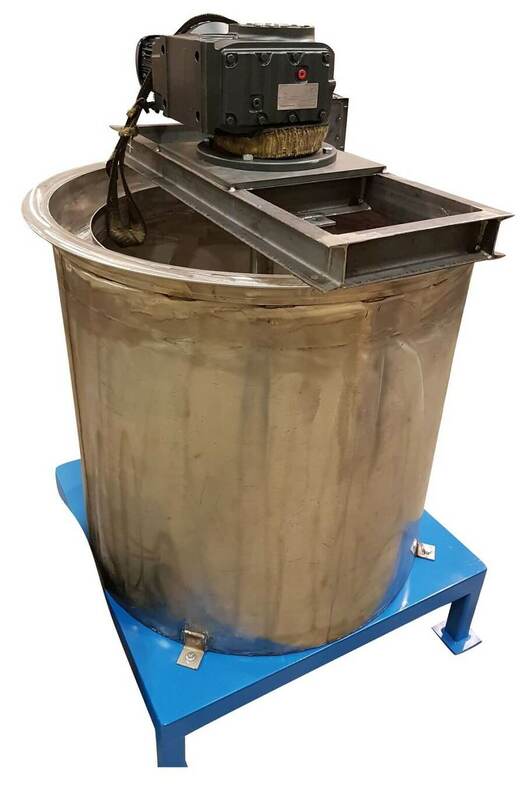 One, each, Plate and Frame Filter Press, 18″, with 2.5 Ft³ Filter Cake Capacity, 51.7 Ft² filtration area and includes heavy ductile iron frame designed for maximum pressure of 60 PSIG and 140 degrees F, 18 chambers, 19 plates, ( caulked and gasketed center feed recessed chamber polypropylene) set of polypropylene connections with locknuts, 1 ½” dia center inlet, four (4) 1 ¼” dia top, bottom corner outlets, inlet pressure gauge- 0-200 PSI, set of #1P1 polypropylene duck filter cloth (6 & 2), hydraulic closing device, Capacity for 50 liters/minute. We manufacture Merrill-Crowe Plants for the recovery of gold and silver from cyanide solutions. 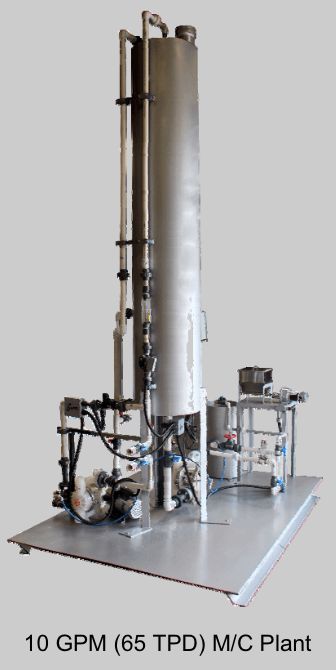 Two primary pilot plant sizes are manufactured, a 10 gallon per minute plant (65 tons of solution per day), and a 50 gallon per minute plant (300 tons of solution per day). The plants are complete and include solution circulation pumps, flow meter for plant feed, de-aeration system with vacuum pump, de-aeration tower level control with recirculation system, precipitation pre-coat filter, clarifying pre-coat filter, zinc dust hopper, zinc dust feeder, instrumentation, internal piping, steel mounted frame. All plants are for continuous operation. All that is necessary for the user to supply is piping to and from the unit, external wiring to the unit and site installation. 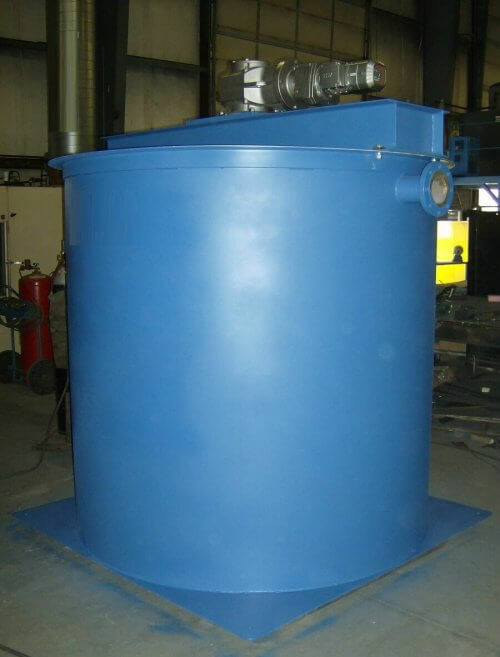 The standard configuration of the Economy Merrill-Crowe Plant uses canister pre-coat type filters for clarifying and precipitation filters. 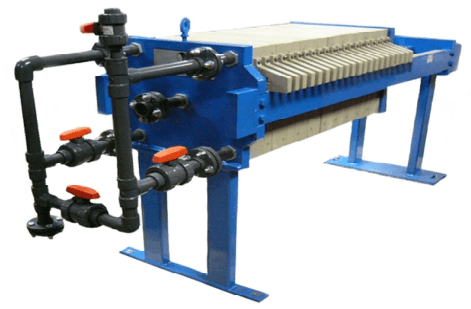 Plate and frame filters are available for precipitation filter, as an option. The dimensional size of the plant is increased when adding the plate and frame filter by approximately 3′ x 6′. Above is a plate and frame filter press, while at left, is a canister type pre-coat filter. The table above illustrates the typical efficiency range experienced by Merrill-Crowe Plants operating in mills. This data was obtained from the now defunct US Bureau of Mines, and involved a study of heap leach mining, carbon absorption and zinc precipitation of precious metals during the period 1980 to 1990. It correlates well with the general rule of thumb, that recoveries from a Merrill-Crowe Plant can range from 70% to 95%. There are many interfering elements. Such as the non precious metal components in the ore, the elements dissolved in the process water, the variance of the ore from day to day, etc. The State of Maine Merrill Crowe plants, which were portable, off the shelf and skid mounted plants. State of Maine Off The Shelf Merrill-Crowe plants were perhaps, the most popular skid mounted Merrill-Crowe Plant in the world, at the time. Since that time, we have upgraded the quality of equipment used in these economy Merrill Crowe plants, while still trying to maintain the price level required for a “economy” Merrill Crowe Plant. Above is a graph of plant volume processed versus the solution content of precious metals for cyanide leach of gold and silver. 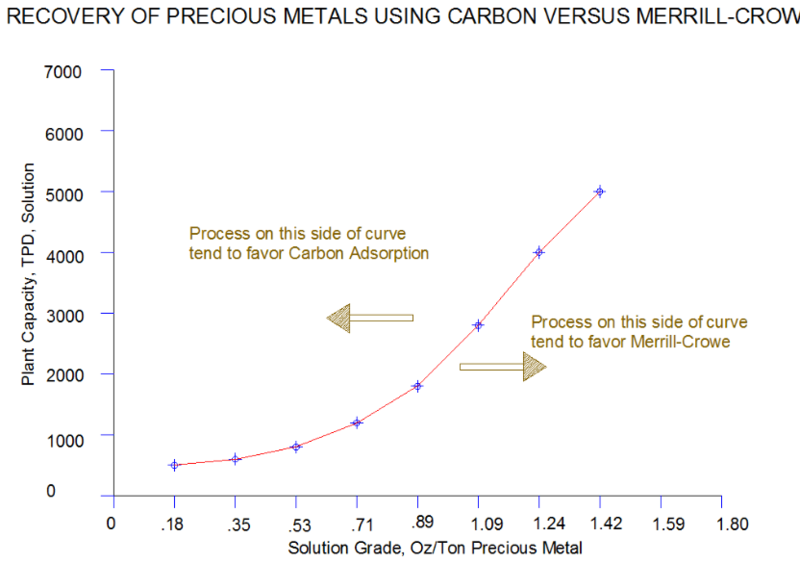 Generally, when the data are to the right of the curve, it might tend to favor a Merrill Crowe Plant, while to the left of the curve, it might tend to favor a carbon adsorption system for recovering the precious metals from the solution. Obviously, there is more to consider in such a decision, but this will generally hold true, and at least indicate one or the other should be considered. 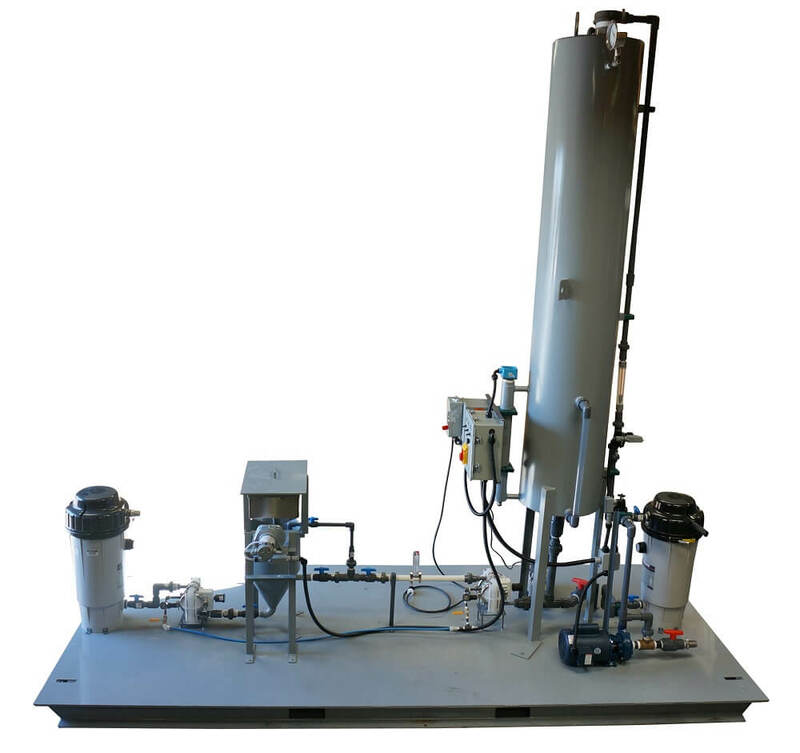 Efficient and complete zinc precipitation of metals from cyanide leach liquors requires that the solution be clarified, to remove all solids, then remove dissolved oxygen. Dissolved oxygen “coats” the surface of zinc, essentially rendering it inactive, in bonding with Au-CN to form Zn-CN, with Au precipitation. Have two sets of canister filters, unhook the blinded filter and place the “new” one in its place (pre-coated with Diatomaceous Earth). Use the optional plate and frame filter press. The discovery that gold was soluble in weak solutions of potassium cyanide (mid 19th century) presented a major tool to gold miners, who could now dissolve the gold in the ore and discard the waste rock. Modern cyanide plants typically use a cyanide solution of 0.05% NaCN to dissolve gold from the ore. Following the discovery of gold’s solubility in cyanide, it was discovered that passing the gold dissolved in cyanide solution through chips of zinc caused a gold to precipitate. The zinc reacts with the cyanide, and releases the gold as a solid precipitate. Early zinc precipitation systems simply used a wooden box filled with zinc chips. These systems worked, however, they were very inefficient, recovering about 30% of the precious metal, since much of the dissolved gold still remained in solution after passing through the zinc box. The discovery that zinc was much more efficient in reacting with a Au-Ag-CN solution when most of the dissolved oxygen was removed, resulted in the Merrill-Crowe process. Merrill-Crowe plants were the first use of the zinc precipitation process that made the use of zinc a highly efficient gold recovery process. Primarily, the Merrill-Crowe process works so much better than the early zinc boxes because in order for efficient and complete precipitation of gold and silver from a cyanide leach solution to occur, dissolved oxygen must be removed from the solution. A Merrill-Crowe plant typically reduces the oxygen content of a cyanide solution to about 1 PPM or less. The product from a Merrill Crowe Plant may be fluxed and melted, poured into dore bars, re-dissolved in cyanide and electrowinned as a higher purity gold product, then melted and poured into dore bars, or sent to a refiner for 99.9 salable gold bars.